Gigabyte has shown off an external graphics card enclosure at Computex that aims to offer better value to those who want to add a graphics card to their MacBook Pro over Thunderbolt 3, with the Aorus-branded GTX 1070 Gaming Box bundling the high-specification graphics card with the enclosure at a lower cost than current alternatives. Connecting with Thunderbolt 3, the Gaming Box is a relatively compact enclosure with a mesh on one side providing extra cooling to the installed graphics card, supplied as part of the package. Inside is a GeForce GTX 1070 graphics card, reports Guru3D, equipped with 8GB of memory, and a base clock speed of 1,531MHz that can be boosted to 1,721MHz. Inside the casing is a 450-Watt power supply, though it is unclear if it will provide power to the connected notebook at this time. Aside from the HDMI, DisplayPort, and dual DVI connections on the graphics card, as well as Thunderbolt 3, the enclosure has a collection of four USB 3.0 ports for connecting extra peripherals. The power supply somewhat contributes to the device's relatively hefty 2-kilogram (4.4 pounds) weight, making it less attractive to be transported along with a notebook, even with its supplied carrying case. 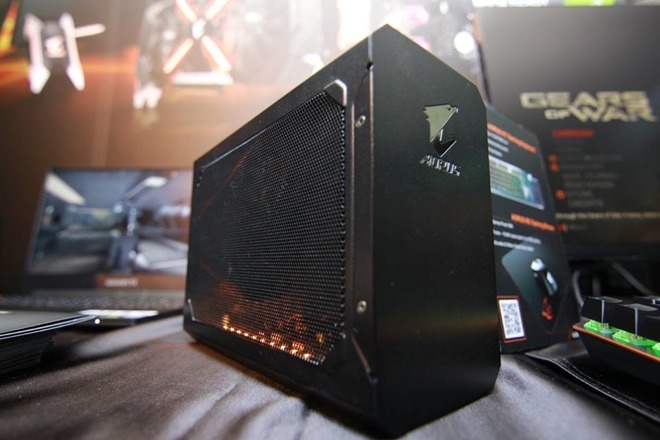 While it is unknown if Gigabyte will be selling the enclosure separately from the graphics card, the Aorus GTX1070 Gaming Box as a complete package may be attractive to some users, due to its price. Gigabyte plans to ship the bundle, consisting of the enclosure and the graphics card combined, for $600 starting in July. The mini-ITX GTX 1070 can be acquired on its own for around $380 to $400, theoretically putting the cost of the enclosure itself at roughly $200, based on the $600 selling price. For comparison, other enclosures like the PowerColor Devil Box are priced closer to the $400 mark, pushing the equivalent bundle price up to around $800 including the cost of an equivalent GPU. While acquiring an external graphics card enclosure may be an attractive proposition to provide extra graphical performance to a notebook, such as for playing games, it is worth noting that the market is still in its infancy. While it is relatively simple to connect and use on Windows, it is a slightly more involved procedure to get the extra hardware running on macOS.